Manajerial (M) is the dissemination of research results or academic review covering all areas of management, but not limited to, business ethics, business strategy, entrepreneurship and innovation, information systems, study international business and cross-cultural, marketing, research organizations and the general management and supply chain and operations management. 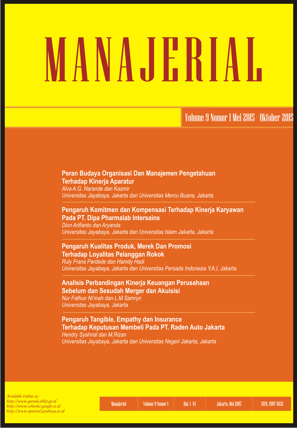 Managerial journal aims to present the latest thinking and research on key management topics in the form of articles that meet high standards of academic quality, while still being accessible to non-specialists. http://ejournal.jayabaya.ac.id/index.php/Manajerial started from 2016. 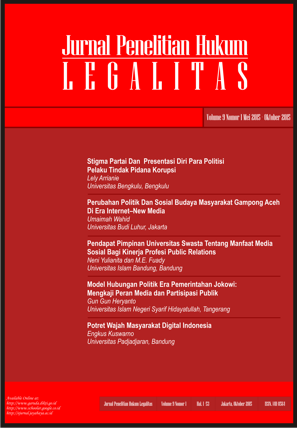 Jurnal Penelitian Hukum Legalitas (JPHL) is published duo-annually in May and November, and aimed to provide research articles in order to have a significant implication to the world of law. Jurnal Penelitian Hukum Legalitas (JPHL) provides cutting-edge and comprehensive analysis of gap between theory and practice as well as the significant implications of the legal world. The scope of this journal has become essential for criminal law, civil, constitutional and international law. The Journal is highly relevant to all professionals, directors, managers, entrepreneurs, professors, academic researchers and graduate students in the field of Law studies. 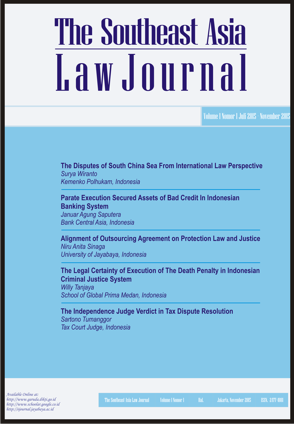 JPHL changed the online version address to: http://ejournal.jayabaya.ac.id/index.php/Hukum_Legalitas/index started from 2016. 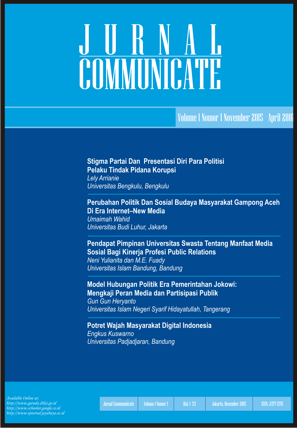 Jurnal Communicate (JC) is published duo-annually in June and December and aimed to provide research articles in order to have a significant implication to the world of communication. The Journal's primary objective is to bridge the gap between theory and practice in communication studies. Every article contains empirical results, research methods, managerial implication and latest references from primary sources. The Journal is highly relevant to all professionals, directors, managers, entrepreneurs, professors, academic researchers and graduate students in the field of communication studies. 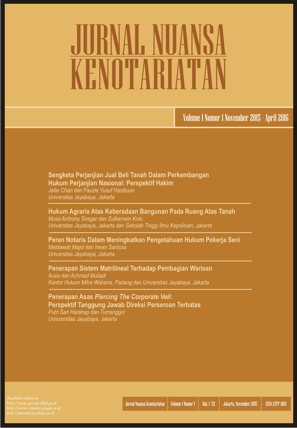 Jurnal Nuansa Kenotariatan (JNK) is is published duo-annually in May and November. and aimed to provide research articles in order to have a significant implication to the world of notary. The Journal's primary objective is to bridge the gap between theory and practice in notary studies. Every article contains empirical results, research methods, managerial implication and latest references from primary sources. The Journal is highly relevant to all professionals, directors, managers, entrepreneurs, professors, academic researchers and graduate students in the field of notary studies.JNK intends as a means of scientific communication notary field and presents articles of interest to the research community in general, new theoretical developments, results of empirical studies, and scientific aspects related to the cultural, economic, political, psychological, and social law and the legal system.